I may be grain-free most of the time, but sometimes I get a wicked craving for something crumbly and savory to break into a soup. That’s where this Almond Thyme Skillet Bread recipe came from (plus I wanted another excuse to use my mini cast iron skillet, I love that thing). This recipe is so easy, and a great use for leftover bacon fat. 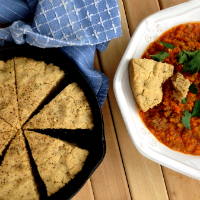 I served the Almond Thyme Skillet Bread with a soup made from ground beef and the random contents of my crisper drawer, but pair it with your favorite winter soup recipe and you’ll be good to go! Almond flour and fresh thyme flavor this easy skillet bread, perfect served with soup or stew. Mix almond flour, baking soda, thyme and salt in a medium mixing bowl. Stir in the eggs and bacon fat, then form the dough into a disc. Pat into an 8" cast iron skillet (or spring-form cake pan) and top with freshly-cracked pepper. Bake in the preheated oven for 45 minutes, then slice and serve warm. This recipe is endlessly variable: use diced fresh rosemary leaves instead of thyme, or add ¼ tsp of cayenne powder instead for a spicy kick. Mmmmm. This sounds like the perfect dinner to end a long day. I want to grab a bowl of this, crumble up the bread and wind down on the couch. I don’t have any bacon fat. Do you think I could sub olive oil ? I just made this and OMG! best bread ever. I think it may also work well as a pizza crust or as a sweeter bread with cinnamon and honey. I love this bread. I may sub. butter for the bacon fat if I do the sweeter bread. Wow, planning a sweet version now! I don’t understand you first sentence. Using almond flour is grain free. Based on the reviews i’m looking forward to trying this! I’m grain-free, but still crave them sometimes. This is my solution: a recipe that’s grain-free but still mimics the characteristics of actual bread. is there a substitute for the eggs? I am allergic to eggs. I have never attempted this with an egg substitute, but if you Google I think there is an option with flax that can be subbed in.